AUTHOR’S NOTE: I developed the following on the Mediterranean diet for one of my clients, whom ultimately left it unused. I share it here as a writing sample… and because I really like food! The formula for healthy eating is pretty basic. Consume lots of fruit or vegetables, plenty of whole grains, enough fish and poultry in moderation. Keep sodium intake low, reduce fat consumption, and limit red meat. As it turns out, there is a region where all these rules of nutrition aren’t just customary, but are also complemented with plenty of flavor. It’s the Mediterranean Sea, and the cuisine the inhabitants of its border nations share is equal parts delicious and heart-healthy. It is known around the globe as the Mediterranean diet. Surely you’ve heard of the Mediterranean diet by now. In case you haven’t, let me give you the lowdown. It incorporates the basics of healthy eating with a splash of olive oil, among other components found in countries such as Greece, Spain, France, Israel, Turkey and Monaco. Wikipedia states it was first presented by the super scientist husband and wife tag team of Ancel and Margaret Keys. Their theories on the advantages of this cuisine remained largely ignored until the nineties. That’s when experts like Dr. Walter Willett of Harvard University’s School of Public Health made it a popular dietary alternative by using long-term study results to confirm its benefits. The diet emphasizes eating primarily plant-based foods. It replaces butter with healthy fats and seasoning with herbs instead of salt. It even allows drinking the occasional glass of wine. Research has associated the diet with a reduced risk of death from heart disease and cancer. If that weren’t enough, it’s also connected to a reduced incidence of Parkinson’s and Alzheimer’s diseases. No wonder Zorba was so jolly. Olives and Olive Oil: It’s one of the flavors most associated with the region. Besides being a great add-on for plenty of dishes, these deliver heart-healthy monounsaturated fat. Olive oil is a great cooking replacement for butter. It’s mainly monounsaturated fat, which can help reduce low-density lipoprotein cholesterol (LDP) levels, A.K.A. the bad kind of cholesterol. Virgin and extra-virgin olive oils also contain the highest levels of protective plant compounds that provide antioxidant effects. Fruits and Vegetables: Always important for healthy digestion and balanced nutrition. According to the Mayo Clinic, Greek people average six or more servings a day of antioxidant-rich fruits and vegetables. This is an appropriate dose, so it may serve you as a guideline. Grains: In moderation, whole grain is an excellent source of carbohydrates. Bread in the Mediterranean is eaten plain or dipped in olive oil, as opposed to butter or margarine, which contains saturated fat. Nuts: Great sources of fiber and protein. High in fat, but most of the fat is healthy. Because nuts are high in calories, you should not eat more than a handful a day. More importantly, avoid candied, honey-roasted and heavily salted nuts. Don’t go nuts (pun intended). Fish and seafood: Grilled, baked or broiled, “fruits of the sea” are served at least twice a week in the Mediterranean diet. 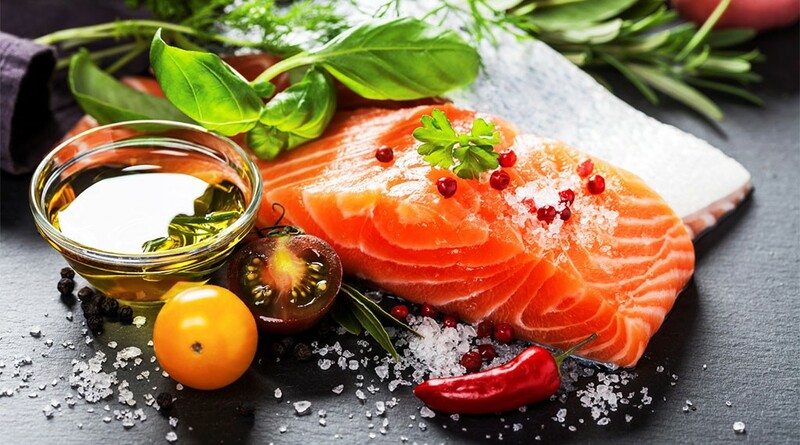 The main focus should be on fatty fish, which contain omega-3 fatty acids. These are associated with minimized triglyceride levels and decreases in blood clotting. This results in less heart attacks, improved blood vessel health and moderated blood pressure. Try mackerel, sardines, albacore tuna or salmon. Mussels are also great, but try to avoid eating them raw. Dairy: The Mediterranean diet allows for dairy products. Just be sure to steer away from the whole fat stuff. Stick with low-fat cheese, skim milk and creamy fat-free yogurt. One of the advantages of eating Mediterranean is its ample variety of dishes, which will keeps anyone on it always looking forward to the next healthy meal. Plates include Greek salad, hummus, seasoned pasta with vegetables, couscous, pita wraps, as well as all manner of fish and greens. Most combinations of the ingredients I mentioned above qualify. There are a few guidelines to follow when preparing a Mediterranean style dish. Relax, they’re hardly rocket science. Remember to include minimally processed fruits and vegetables. These should make up the majority of your meals as well as your snacks. Season your dish with herbs and spices. Accompany it with whole-grain bread, rice, cereal and pasta products. You may complement your meal with the occasional glass of wine (yay!). Just don’t go overboard. Any health benefits the Mediterranean diet offers increase when combined with an acceptable amount of physical activity. (In case it wasn’t obvious.) So make sure to channel all the energy you get from that Moroccan grilled salmon you ate by frequently jogging, riding your bike, going to the gym or playing your favorite sport. What makes the Mediterranean diet stand out? Contrary to most well-known diet plans, it really isn’t a fad. Therefore, you’re not actually starving yourself to a slimmer figure while endangering your health. Also, it’s relatively easy to incorporate into your lifestyle. If you’ve already used to eating plenty of salad, as well as cutting down on the sugar and sodium, chances are you’re already on it, or are only one plate of olives away. Above all else, Mediterranean cooking techniques are fun and create delicious results. It may be hard to adapt for those not used to eating plenty of fruits and veggies. Once your taste buds get the hang of it, though, you might never go back to your bad eating habits again. Here’s a link to Mediterranean options on AllRecipes.com to get you started. Try the Mediterranean diet out and you’ll be shouting “Opa!” in no time. Just don’t break your whole plate collection. Most of the health benefits mentioned here derive from the Mayo Clinic website. Click here to read their original article.